There is no ready pulse generation on the motherboard, trackdisk.device always assumes DF0 is present. If the drive is capable of generating its own ready pulse, it will detect a HD drive (ks 2.04 + setpatch or 3.x needed). could this be an issue for internal goteks as well? I haven't gone back to the issue yet but I have an A500 rev5 mainboard. The original internal floppy drive was DD and I replaced that with my GoTek. i don't recall if the gotek required some setup besides DF0 jumper. I never had an HD floppy in an Amiga before so I'm curious if it really is just plug and play or not (some additional steps required). That will just work, Amigas don't have built-in ID circuitry for DF0, as the OS by default assumes a double-density DF0 drive is present. Hence FlashFloppy's ID generation for HD images will simply work. OK great. I'll try to get to some testing this week and report back with files via github if necessary. I haven't yet upgraded to the latest and greatest version. Yep, I know how easy it is, I've not been at my Amiga much and haven't had a need for Hd adfs when I do get to power it up is all. voyager, Jope: You are correct of course, an ordinary Amiga drive enclosure will always emit the Amiga-DD ID sequence and that overrides he Amiga-HD sequence. Hence HD disks get identified as DD and are unreadable (or even, confusingly, unreliably unreadable!). The simplest universal defeat is to modify the enclosure's interface board: cut the trace to pin 1 of the external connector, and connect pin 34 of the internal drive connector to pin 1 of the external connector. I will add this caveat and guidance to the FF wiki. Bypass the internal board of the enclosure and connect it to pin 34 DSKCHG <- Disk Change/Ready on the gotek? 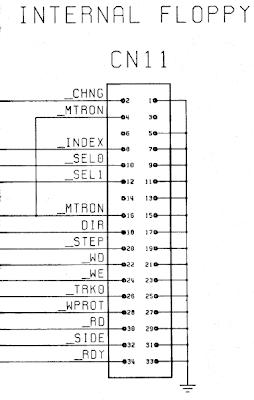 When talking about drives connected to the Amiga, you should look at the Amiga disk pinout.. So there pin34 is ready, pin2 is diskchange. Perhaps it makes more sense now. In addition to connecting the gotek's ready directly to the amiga floppy bus's ready, you should also disconnect or completely remove the TTL chip (often a 7438) that provides the ready pulse on the external drive enclosure's PCB. Last edited by Jope; 02 July 2018 at 14:29. That will just work, Amigas don't have built-in ID circuitry for DF0, as the OS by default assumes a double-density DF0 drive is present. Which models? I put an HD drive in my 1200 and it works in both modes as expected. The OS assumes a DD drive by default, but will respect the HD ID if it sees it. It checks every time a disk is inserted. Hi all, I guess I need some help. I recently acquired a nice Amiga 500 unit with memory expansion and lots of stuff. It came with a builtin Gotek drive that is running FlashFloppy as firmware. It's an internal drive with two buttons. Took me actually ages to find out it's using a different firmware since I'm pretty new to this. However, I encountered a few odd things which I have no idea how to solve them myself and hope you guys have some answers. I'm also not sure if all is FF related. I pretty early knew that I may have some problems. First thing I did right away (I'm using a Gotek on my Amstrad CPC so I'm familiar) is that I tried some games. I found out that for certain games swapping disks won't work. The first disk always loads fine, when I need to swap to the 2nd disk, I navigate to the appropiate image via the buttons and then happens: nothing. I've tried a few Cinemaware titles (Wings, It came from the Desert, Defender of the Crown). All the same issue. Full Contact for example is working. I then thought it might be a firmware problem so I checked what we got and it confuses me to be honest. 1) When the Gotek came (already flashed with FF), the USB stick I got alongside with it had AUTOBOOT.HFE and HXCSDFE.CFG from the HxC project on it, not the AUTOBOOT and config that comes with FF. It works even though you get a notice that you're running a different firmware. 2) I updated FF based on the Wiki and the Gotek showed me that it worked. Also when I run the stick again the FF firmware has the newest version number (as seen in the bottom left). 3) When I try now to replace AUTOBOOT.HFE and HXCSDFE.CFG with the ones from the FlashFloppy distribution I surprisingly get "ERROR: writesector -> failure while seeking the track00!". The ones from HxC notably work. Yes, I reformatted the stick and then I put those files first on it again. No change, only the HxC ones work. 4) And I still have the problem with swapping disks as mentioned above. Any advice what this could be? I opened the Amiga and the Gotek is jumpered S0. 5) One thing I noticed is that the drive LED is constantly lit, which in my understanding isn't correct? Last edited by 8bit_era; 05 August 2018 at 09:01. A permanently on floppy LED is normally a sign that the floppy cable was connected upside down in one end, however if that was the case you would obviously not be able to load anything. The red light is permanently lit if you've got an OLED display connected. Is that LED even visible on some Goteks? On all the ones I have seen, it is only internal. Oh, well! So the LED we are talking about is not the one on the Amiga case. It's the Gotek's internal one. Well, in this case... who cares? I had flashed my Gotek with Flashfloppy eons ago. I had a version that dated back to September 2017. Did the procedure (copy .upd file to usb drive, power it on with both buttons pressed), it updated very fast. But now all I get at my LED display are the letters "rSt". Can't choose any files at all. I copied the FF.CFG file to the usb drive and still all I get is this. found out I need to use "HxC Compatibility mode" with an old 7 segment LED display. I already copied the proper files to the USB stick (were already there but did a overwrite anyway) and still nothing. You have a short to ground at jumper position JA (which is used to implement the optional third button). Check that the only jumper at the rear of your Gotek is at position S0. Remove any other jumpers. Then report back. Do you have any plans to support a 20x04 display? It already works fine as a 20x02 though as it is. Maybe if you end up supporting 2x drives from the Gotek, the 20x04 would be useful? Or to show very long file names without scrolling! It's almost as big as the Gotek too. It looks huge, and very out of place beside the 128x32/128x64. If I ever support more lines of text on the 128x64 OLED then I will support x04 LCD displays too. It's mainly just a case of not having designed text to put on the extra lines.